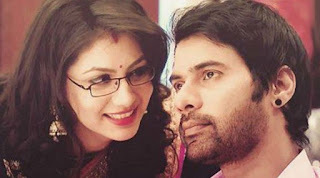 Kumkum Bhagya starts with Karan saving Abhi(Shabbir Ahluwalia) just in time and then the terrorist takes up burning log and tries to hit Abhi and Rishab. Munni (Sriti Jha) jumps in right before Abhi to save him as Abhi again gets lost in her and remembers every time they have been in trouble and saved each other. Suddenly the terrorist hits out and they get separated again. Karan comes in once again and hits the terrorist on head making him unconscious. Dadi and Dassi watch news and come to know about the attack and decide to call Purab (Vin Rana), they call him and say that they are coming there. Purab and the police cannot seem to find a way to go inside. Abhi and Rishab break open a way and save people and letting them run. Aliya (Shikha Singh) and Tanu (Leena Jumani) worry about Munni reaching Abhi but they decide to leave as the fire at the tent gets worse. Rishab at the other entrance sees Munni and thinks how brave the girl is when he sees her saving the people. Dadi and Dasi fuss before Purab who tries to calm them. The terrorist threatens to set Abhi on fire with a burning rod in his hand while Karan hits him with his bat on his head and he dies. The fire spreads in the venue and there is a stampede and everyone rushes. Dadi turns on the news and comes to know about the incident and she reaches the venue. Abhi then shows Rishab Pragya’s photo and asks him if he saw this girl anywhere around. Rishab shows him where he saw her while Munni faints at a corner. Abhi finds her there and picks her up and both of them run to escape. Mithali(Swati Anand) too finds out about the attack and yells out to the family and tells them about this. They watch the news worried. Tanu and Aliya watch outside as Purab waits for Abhi to come out with Munni. Tanu is happy that Munni died but Aliya is worried about Abhi. Karan waits at the roof of the tent as he wants his brother and Abhi to come up as the only way out is through there. Abhi is worried though but Rishabh convinces him to go on. Purab and Dadi are still out as they aren’t able to open the door. There Mitali turns on the news and informs the rest about the incident. Abhi and Rishabh aren’t able to find a way out when Karan calls them. Precap: Dadi and Dasi attend to Pragya / Munni as Abhi sits by her, they say they still cannot believe this and Purab watches them as Abhi says he was sure that Pragya would be back.